Please note: This is only a word document with the codes and screen shots. Please re-code in your own program. Write a program called InheritanceTest.java to support an inheritance hierarchy for class Point-Square-Cube. Use Point as the superclass of the hierarchy. Specify the instance variables and methods for each class. The private variable of Point should be the x-y coordinates. The private data of Square should be the sideLength. The private data of Cube should be depth. Each class must provide applicable accessor, mutator, and toString() methods for manipulating private variables of each corresponding class. In addition, the Square class must provide the area() and perimeter() methods. The Cube must provide the area() and volume() methods. Write a program that instantiates objects of your classes, ask the user to enter the value for x, y, and sideLength, test all instance methods and outputs of each object’s perimeter, area, and volume when appropriate. Have your program accept the user input in two text fields. 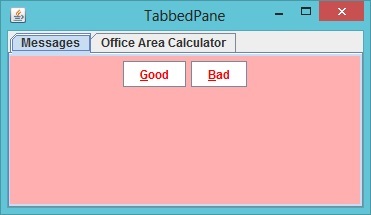 When a button is clicked, your program should calculate the area of the office and display the area in a text field with a label of Area. This display should be cleared whenever the input text fields receive the focus. A second button should be provided to terminate the application (Exit button). The following tutorial shows you much of the code solution. Feel free to use the tutorial, but make changes so that you are not simply copying the tutorial code for your entire solution. To make this different from the tutorial, change the colors of the panel. Also, add this application to the same tabbed pane (see the JTabbedPane tutorial) as the application you built in Step 2, the DayGui application. yes i have used JFrames in developing the GUIs.